Learn these clean car engine tricks from the detail expert himself. Cleaning your engine is easier then you think! 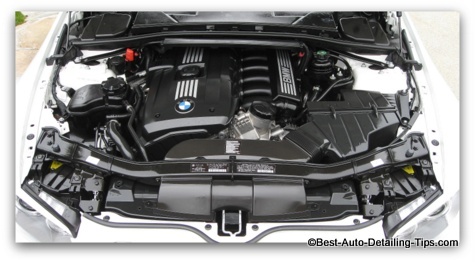 When it comes a clean car engine, many people are scared by the thought of cleaning a car engine themselves. Due to the many electric connectors and other moving parts that make up a car engine, the thought of detailing the motor makes most of us run in the opposite direction. 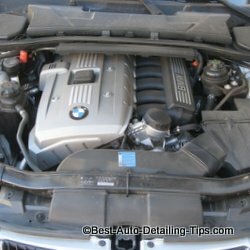 The good news is that despite all the bad information repeated by misinformed people, car engine cleaning is one of the easiest jobs in the area of auto detailing in general! 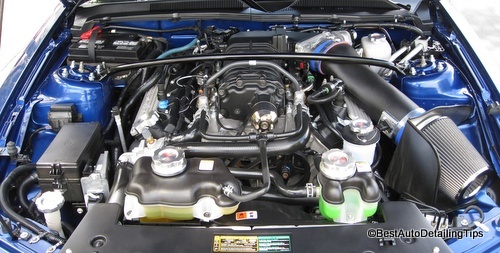 A few simple steps will go far when it comes to engine bay detailing and cleaning. Follow along as we dissect this area of auto detailing so you can become part of the select group of people known as the informed, and enjoy the benefits first hand that a clean engine means! A Clean Engine is a Happy Engine! Just look at the difference between the before and after car engine pictures just below and tell me which you would rather see when lifting the hood to your car! The analysis of a car engine. Why would you want to clean a car engine? Is it as difficult as it seems? What is the best car engine cleaner to use? What are the safe methods for a clean car engine? Much of the engine is covered in plastic shrouding. Electric connectors are fully protected with sturdy plastic housings and assembled using moisture protecting grease. Electronic ignitions mean the elimination of traditional distributors and carburetors. Alternators remain as the only sensitive area with the appearance of exposed wires, etc. The good news is that any modern day car engine (referring to any car engine within the last 20 years) is extremely protected from water, dirt, and other harmful elements of car ownership in the real world. The alternator is about the only thing any lay person can identify that would represent some form of risk, and the good news is that alternators represent no risk from direct contact with water. I believe that mechanics treat cars relative to how your car has been kept up to the point they start to work on it. A dirty engine for many mechanics is a sign of a non-particular customer. A clean engine reveals any problem areas of an engine when leaks of any kind occur such as oil or coolant leaks. A person forgets to install engine oil cap and creates a mess throughout engine bay. Dirt by nature will degrade anything and everything within your engine bay. Spray engine cleaner or degresaser over entire engine and engine bay. Spray to remove engine cleaner and dirt from engine bay and engine with water; either from pressure washer, self-serve car wash bay pressure washer, or water nozzle attached to your own garden hose. Blow engine and engine bay area with leaf blower, or compressed air to remove excess water from engine before starting engine. Start engine and run for 5 minutes to completely dry all moving parts. Follow-up with engine dressing if desired. Most cleaners with some form of degreaser will work. The more dirt, grease, oil, and grime, the more you will want what would be called a heavy-duty degreaser. 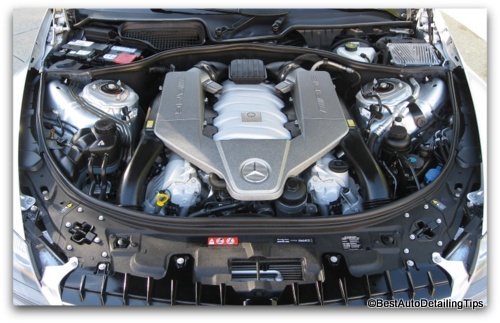 What is the Safest Method for Cleaning a Car Engine? Engines are made up of hundreds of parts; it would be virtually impossible (unless your car engine was already meticulously detailed) to think you could clean every individual part by hand for fear of getting your engine wet. I realize that no matter what I say, there will always remain skeptics who will be forever fearful of getting their car engine wet. I still have customers who forever cling to the fear of getting their engine wet. 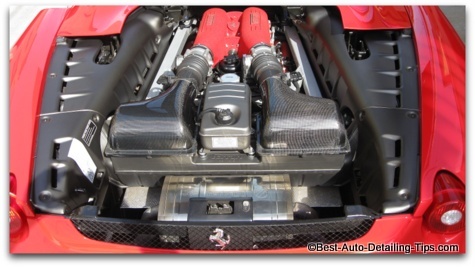 My clean car engine tips are based on twenty-plus years of professional detail experience. Spray engine with degreaser; a cool to warm engine is preferred. An overly hot engine is not recommended as your engine cleaner will dry too quickly. Keep chamois or micro-fiber handy to wipe off any over-spray from car paint; or, apply a layer of car wax to painted areas surrounding engine bay prior to spraying any engine cleaner to engine. Manually agitate excessively dirty areas of car engine and engine bay area with brush for a really clean car engine! Don't over-saturate car engine with water pressure. Use enough to do the job and apply caution to protected areas such as fuse boxes. If this is your first time, you will be nervous. But go easy and work into the process little by little if you remain uneasy. Once again, I have done hundreds of engines in this manner and have yet to have any problems. I have also consulted with more than one mechanic and have verified my process. Blow excess water from engine bay with leaf blower, or pressurized air. Start engine and allow engine to raise to normal operating temperatures for complete and thorough drying of all engine components; I also switch the AC on so compressor engages and runs while engine is running. This only takes about 5 minutes of operating time. Apply aerosol engine dressing shown below if desired for shiny appearance after engine is allowed to cool. This is what is going to make your clean car engine really pop! Follow manufacturers directions on product label. See this link for my full write up on the Meguair's Super- Degreaser. Does not leave white residue like other degreasers can. Is not caustic like traditional "hot" degreasers are. Perfect for anyone who is looking to do more than just a single engine and wants a more economical engine degreaser. Can be used with or without water. (this means you can spray, agitate, and rinse with water. Or simply spray and mop up dirt, grease, and grime without rinsing first. Perfect for any car owner or driveway detailer. Concentrate; can be custom diluted based on your needs. Perfect to clean car engine. Versatile product for many other types of cleaning duties. The following tools can be used to not only make your job easier, but deliver superior finished results. Your hand will tire quickly spraying cleaner from a trigger sprayer; use this pressurized sprayer with nozzle extender for ease of use, as well as control of spray pattern and direction. Also ideal for degreasing inside fender wells or other large areas to be sprayed such as under-carriage, large off-road tires, etc. Also good tool for use with wheel cleaners. I have a pressure sprayer that I use for both my wheel cleaner and degreasers due to the large amounts of these chemicals I go through. You may not think you will need one if you are just a driveway detailer, but when you clean your wheels, engine, or have large tires, these pump sprayers really save you a boat load of time over traditional hand held spray bottles. Use appropriate brush on various engine parts, or on the underside of hood to help agitate and break down build-up of dirt and grease. Also effective for use in wheel wells, tires, etc. Feathered tip bristles for extra effectiveness and safety. No degreaser in the world will be a true, "Spray down, wash off and every bit of dirt and grease is magically gone". You will always be required to do some level of manual agitation and these brushes are ideal. This will be your final stage for a clean car engine that is detailed to perfection; it is also an area with many conflicting opinions. Depending on your situation, you may want to apply a dressing to your engine. I will lay out the pros and cons of this decision so you can be fully aware of the many variables. Not only can an engine dressing create a shiny and new appearance to your freshly cleaned engine, but can actually serve as a sacrificial layer that is easily washed away and reapplied each time. Creates an amazing shine and restores that new car look to your auto engine detailing efforts. Creates a completely uniformed appearance to the engine that is almost impossible by simply degreasing and pressure washing the engine and engine compartment. Creates a sacrificial barrier for everyday dirt and dust to attach to that can be easily washed off and renewed each time. Can't really think of anything else other than that; I remain a big fan of dressing an engine. I consider engine dressing as a sacrificial layer that is easily cleaned off each time. It provides a layer between your engine components and any dirt/dust/oil that will naturally accumulate. This can be used straight (neat) or diluted down with regular tap water. I use straight when using on tires. When I am using this dressing to dress a newly clean car engine, I dilute down to create a thinner dressing that sprays more easily from a spray bottle to cover entire engine and all its components. I also use a diluted version to spray into fender wells to create a deep, glossy black finish. I also use a diluted version to spray directly onto big sidewalls of off-road tires or RV tires. If you want to see my dedicated page on tire dressings and the applicators I recommend, see best tire dressing. Aerosol dressing is as easy as easy gets. Apply to the cool engine after you have degreased, washed off, blown dry, allowed engine to run for complete drying, and cool down following those steps. Manufactures label will say that product is flammable. I have never had a problem in 20+ years of doing engines. Just like gasoline, it is the fumes that are flammable and must be used on extremely hot engines or come in contact with direct flame for combustion. For this reason, simply use on a cool to warm engine and you will be fine. The end results are both dramatic and surprising to any first timer! A Clean Car Engine is a Happy Car Engine! Whether this is the power of suggestion or not; I am a big fan of a clean and detailed car engine! 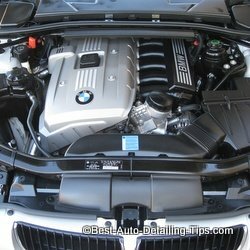 If you would like additional motivation for a clean car engine, you can go to car engine pictures where I highlight many additional clean and detailed car engines. If you know anyone who might benefit from this info like yourself, please forward the link to them; or simply share on your favorite social media site.